Another day of indecision and uncertainty on the dollar yen chart, which ended the trading session with a repeat of Friday as a smalldoji cross candle, as the currency pair trade in a very tight range. As outlined in last week’s currency market commentary for this pair, the 88usd to yen price level is key to the short term direction for the dollar yen, as it is at this level that we saw some intervention from the Bank of Japan last time around, a pattern we may see repeated as the yen continues to strengthen against the US dollar. As always the number one priority for the BOJ is the Japanese export market, and should it perceive that the downwards trend for the pair is likely to damage any recovery from the recent recession, then it will step in and take action to support the Japanese yen. 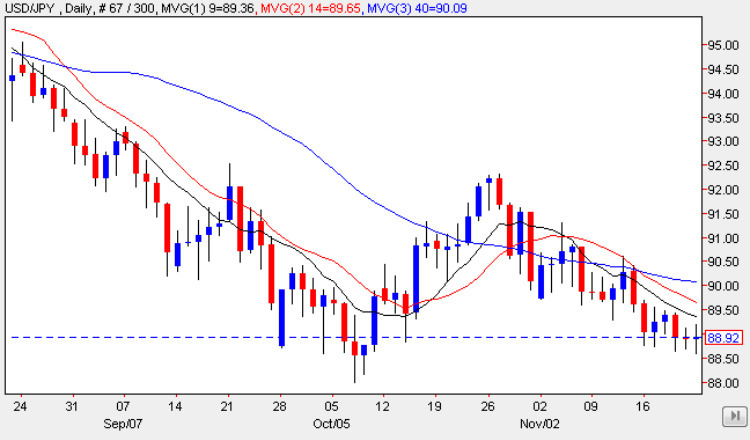 With all three moving averages now weighing heavily on the pair the bearish sentiment remains firmly in place for the time being, and therefore any further downwards momentum is likely to trigger the BOJ into action so we can expect to see a bounce once again in due course. Longer term of course any recovery in the pair will require considerable momentum to breach the deep and substantial resistance areas now sitting above, with the first of these being in the 91 to 92 price level. Following yesterday’s national holiday in Japan this morning say the release of the BOJ November report in which the Bank expected the economy to pick up over the next few months but warned that it was still weak and fragile suggesting that it may slow down once the effect of the stimulus measures have run out when the new fiscal year starts in April. Meanwhile in the US the markets will be considering the Preliminary GDP figures due for release at 14.30 GMT and later the CB ConsumerConfidence data which is forecast at 47.6, slightly down from previous.